Zaha Hadid Architects’ new Galaxy Soho building in Beijing is a masterclass in rendered reality, yet it already has issues with vacancy, doppelgängers and the heritage lobby. Is this the end of starchitecture as we know it? Dan Borden paid a visit for uncube. Beijing’s urban plan is über-rational: the rectangle of the ancient Forbidden City is at its core and a series of squarish ring roads echo outward. Today, Ring Road 2 is a four-lane expressway lined with prestigious office towers, blocks of mirrored glass and granite that suggest commercial architecture hasn’t evolved in decades. Surrounded by these flashbacks to the 1970s and 80s, the new Galaxy Soho complex designed by Zaha Hadid Architects (ZHA) seems literally unreal. It’s a shimmering mirage of smooth, white mounds fifteen stories high. What are they? Giant eggs? Rolling hills? Water-smoothed stones? Hadid’s building shouts: Enough with the visual metaphors! This is what the 21st century should look like! The complex is part of Chinese billionaire developer Pan Shiyi’s growing empire of Soho mixed-use projects. His strategy: use cutting edge design to draw sophisticated office and retail tenants. You expect curvy organic shapes when you hire Zaha Hadid, but Galaxy Soho is also brilliantly rational. The rounded towers are built up, layer by layer, of white aluminium planes separated by wrap-around tinted glass, like a gigantic stepped topographic model. It’s the natural digital-era descendant of those 1930s ribbon-windowed skyscrapers that dared to round their corners, like Berlin’s Shell-Haus. Most of 21st-century Beijing is not very pedestrian-friendly, but Galaxy Soho has a direct tunnel connection to the city’s subway system. Although it’s 500 metres long, it’s worth the walk. It opens onto the project’s central public space, an outdoor retail mall in the “valley” between the four towers. 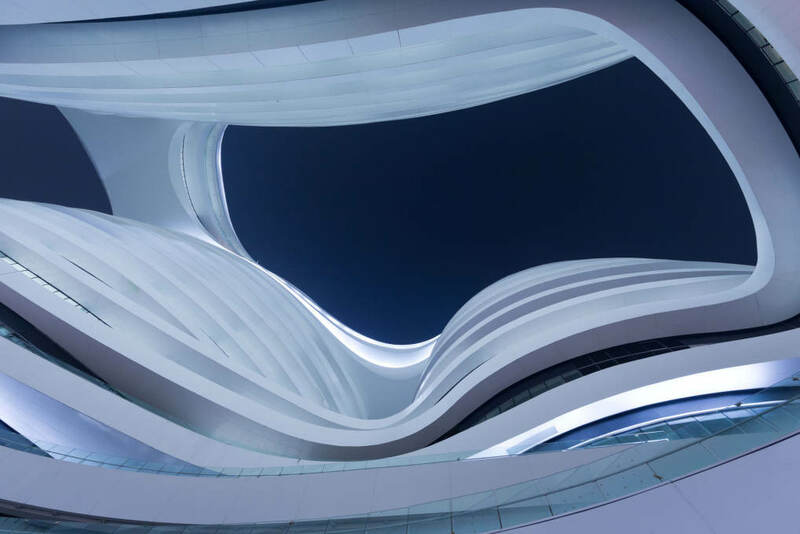 Hadid describes it as a gesture to traditional Chinese courtyard buildings, but it’s dramatically different from its historic models. It’s a long, winding space two levels below the street, so the four office towers rise 17 floors above, connected by sinewy crosswalks that resemble pristine white tendons. It’s also dark – the towers block the sun – and a bit claustrophobic. Beijing is a notoriously dirty place to work, both figuratively and literally. The Galaxy Soho employs an army of workers to scrub the city’s pollution from its lovely skin. But there are other pitfalls peculiar to architects. Beijing maps still label the building’s site as “No. 7A Small Arch Hutong”, a centuries-old neighbourhood of authentic courtyard buildings that was bulldozed in the name of progress. When the Royal Institute of British Architects honoured the building last year, they got a protest letter from the Beijing Cultural Heritage Protection Centre. The watchdog group contends the project has “caused great damage to the preservation of the old Beijing streetscape, the original urban plan, the traditional hutong and courtyard houses, the landscape formation, and the style and colour scheme of Beijing’s unique vernacular architecture”. The architects’ response was simple: the site had been cleared before they were hired. Eleven kilometres north, Hadid’s firm has designed a sister complex, the Wangjing Soho which is basically the same design stretched twenty stories taller. An identical complex is also rising 1,500 kilometres south in Chongqing. The problem: Hadid didn’t design it. The country notorious for counterfeit iPhones and fake Prada bags is now pirating building designs. A Chinese proverb says,“The copy honours the master”, but this is one honour Dame Zaha could do without. ZHA has accused the developer Chongqing Meiquan of not just borrowing the concept but actually stealing computer files. The developer responded with a new ad slogan: “Never meant to copy, only want to surpass”. Zaha Hadid’s undulating Soho Galaxy now lights up the night on Beijing’s second ring road. Galaxy Soho may be most beautiful at night, lit dramatically and glowing Beijing’s haze. But the night-time view also reveals a reality that neither the building’s owners nor Beijing’s government would like the world to know: it is almost completely empty. Despite official assurances that the city’s office vacancy rate is only 4%, the building’s lack of tenants suggests otherwise. Six months after its opening, Galaxy Soho’s building manager, in moment of candour, told a Chinese real estate journal it had a 100% vacancy rate. When I walked through the building in October – one year after it opened – it was like a ghost town. The retail courtyard had just one lonely shop selling packaged ramen noodle and Pepsi. Behind Galaxy Soho’s aluminium and glass skin, there is nothing but air. So what are those four sensual towers – the gorgeous, shimmering symbols of Beijing’s real estate boom? They’re four giant bubbles.